Humans and human activity often cause pain and suffering to wild bears. This does not mean there is not some of the same in a bears natural world. However, people inflict the most pain, suffering and mortality. Keep in mind very few wild bears actually die of old age. The vast majority are injured or die due to human activities, hunting being a major cause of bear mortality. Time and effort to rehabilitate bears young and old that have been orphaned or caused injury at the hands of people has great importance. Helping the individual animal is rewarding. More important is the message to people in general. We as humans can learn to coexist with less damage to our environment and the wildlife that inhabits the environment with us. Education, awareness and understanding bear behavior can reduce fear of the animal and increase appreciation and awe. 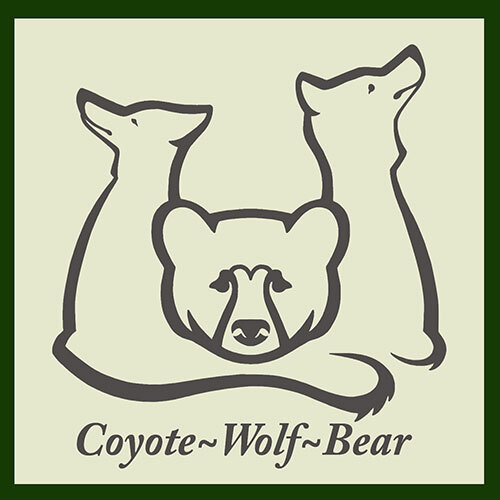 Wildlife rehabilitation and education is important as the practice helps increase public awareness and hopefully will encourage people to alter habits and thought processes, therefore reducing the need for rehabilitation. As a wildlife rehabilitator of bears, a success would be a rehabilitated orphaned cub that is returned to the wild at the age of 18 months and survives in the wild to the age of reproducing on its own (4 to 7 years). Starving people died by the thousands after they were offered food again at the WW-1’s end. A condition known as “re feeding syndrome” is a killer. Starting to eat again after a period of prolonged starvation can precipitate cardiac failure. In starvation the production of insulin is decreased in response to a reduced intake of carbohydrates. Instead fat and protein are burned to produce energy. This results in a cellular loss of electrolytes. When you start to eat again a sudden shift from fat to carbohydrate metabolism happens and production of insulin increases, which can lead to profound hypophosphatemia. This can occur within four days of starting to eat again. This can cause heart problems, or other dangerous conditions. Starving patients can be treated, but this must be done cautiously to avoid refeeding syndrome. Rest and warmth must be provided and maintained. Small sips of water mixed with glucose should be given in regular intervals. Fruit juices can also be given. Later, food can be given gradually in small quantities. The quantity of food can be increased over time. 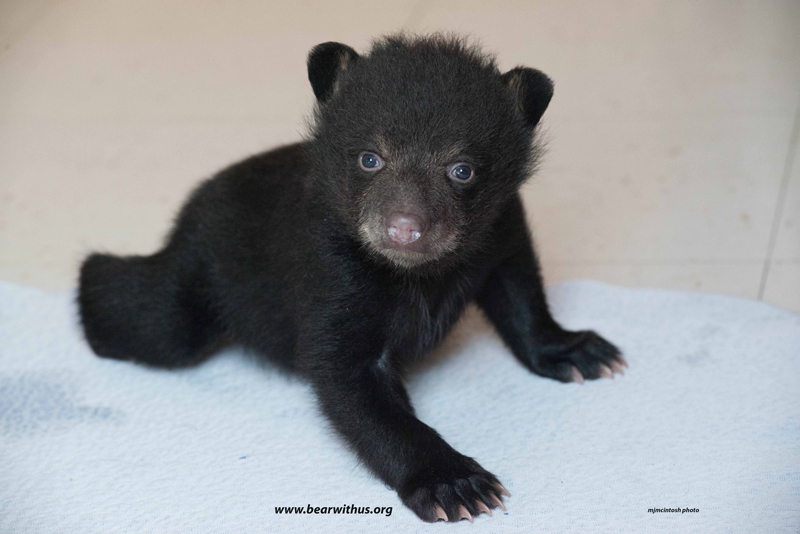 … At Bear With Us we have lost a few cubs due to this condition. When a cub dies it is most likely destined to die before we get it because the condition has began to take effect on the poor little bear before we catch it, then the cub dies a few days after arrival. We are very careful when we have cubs arrive. -Extremely acute sense of smell. Scent oriented mammal. 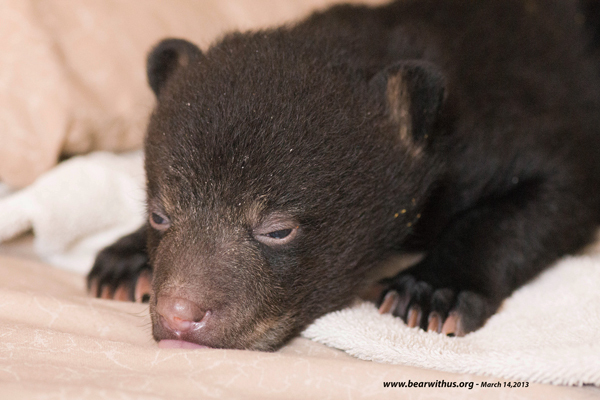 -Cubs don’t imprint like some birds, but can quickly learn to trust their caregiver. -Food and security is important to bear cubs. They get both from mother. -Caregiver must be careful to wean young cubs from looking to caregiver for protection. 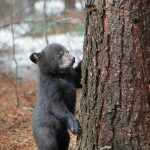 -Cubs need to be offered wild foods indigenous to area of release. -Feeding habits are learned – worth repeating, important to remember. -Release to wild is at about 18 months and when wild food supply is abundant. 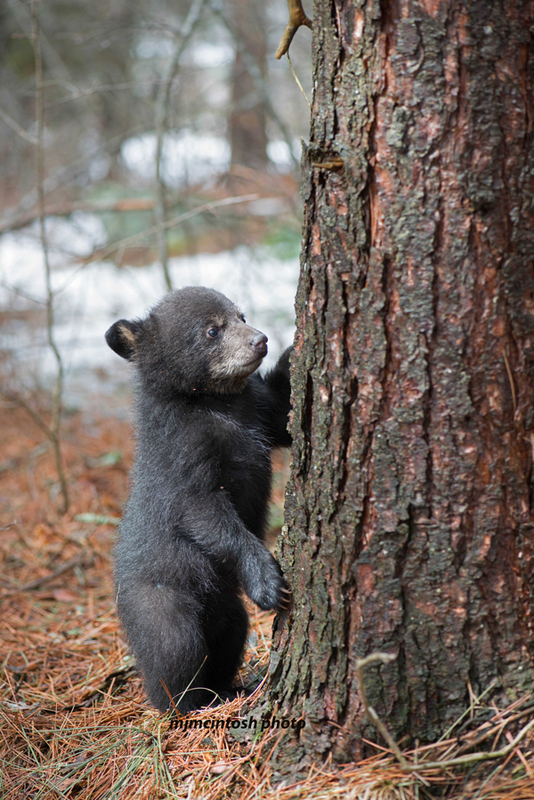 -Bear cubs should fear people when released for the bears long term survival. -Bears have different personalities. Some are less fearful or nervous than others. Be aware of behavioral differences when working with bears. -Ear tagging bears is a must if animal has been sedated. -Consider the bear regarding pain, stress, fear. Not your fear, the bears! -Injured adult bears are possible to work with. 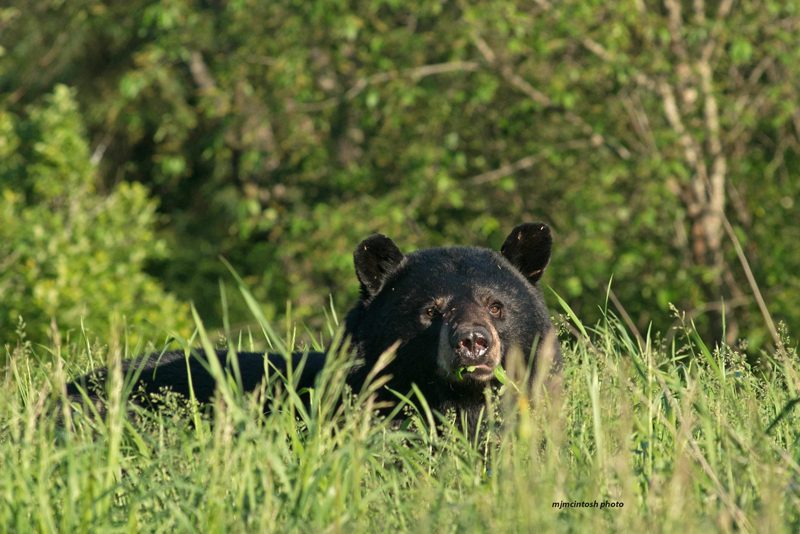 Caution, Precaution and an understanding of bear behavior is crucial. Be careful. Bears may hurt people trying to escape or self defense. -Remember, the bear has no way of knowing you are not trying to kill or hurt it. Move slowly, quietly and speak in low easy tones. Shouting and loud laughter is not appropriate. -Bears are extremely powerful and can be dangerous. We are always cautious and considerate. Would you like to learn more About Bears? 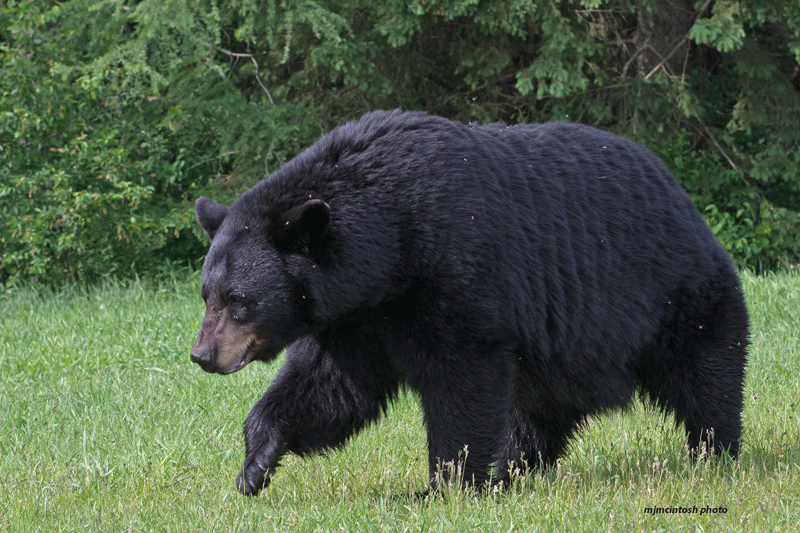 Full-blown attacks by black bears are rare. 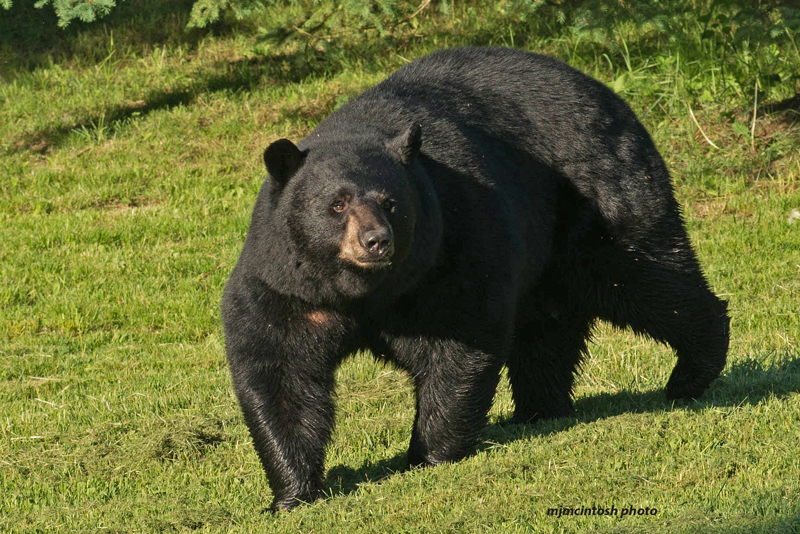 Black bears attacks are usually not at campgrounds and are usually not by black bears that are familiar with people. How likely is a black bear to be a killer?